I recently retired after spending the past forty years as a Certified Public Accountant. Mr. Constantine Soo suggested that I try something both new and different, such as writing about audiophile gear for his Dagogo webzine. Since I do not own or have access to the super expensive gear that most reviewers have, I decided to start writing about phono cartridges that I have owned and used over the years that are still readily available. I reviewed my favorite cartridge, the Hana EH high-output moving coil, for my initial review. My second review will be a cartridge that I have been using off and on for the past two years: the Ortofon MC1 Turbo. My main phono cartridge for an 18-year period was the Grado Reference Platinum. It hummed faintly, however, you could only hear the hum when you were close to the turntable. This was my favorite phono cartridge until I purchased the Hana. When the first Grado started showing signs of wear after years of constant use, I traded it in for a second one. The stylus was not user replaceable so you could either trade it in or get it retipped. When my second Grado started having inner groove distortion from wear, I knew it was time to replace the cartridge. I was ready for a change, so I took my time deciding which cartridge to buy. I purchased an Ortofon MC1 Turbo to use until I made my decision. Ultimately, I purchased the Hana. It is difficult to audition phono cartridges, so you have to rely on a store with a knowledgeable sales staff. Fortunately for me, my local stereo shop, Shelley’s Stereo, carries a wide assortment of phono cartridges and, based on their suggestions, I bought several cartridges to play around at home. One was the $240 Ortofon MC1 Turbo, a high-output moving coil. I had used an Ortofon X1MC high-output moving coil in the past and thought it was an enjoyable bargain, so it was not too much of a stretch to buy this cartridge without listening to it first. My turntable is the AR “The AR turntable” with a Sumiko Premier MMT tonearm. I use an NAD PP1 phono stage. I have not upgraded the phono stage because this phono stage works well with the rest of my system and is also dead quiet. No RF of any kind and no noise. My experience tells me there are subtle differences between inexpensive and more expensive phono stages, however the phono cartridge makes a much bigger difference. I have heard big differences even when comparing comparably priced cartridges. Others may disagree and that is fine. The preamplifier is the Antique Sound Lab Line One tube preamplifier. The amplifiers are a pair of Quicksilver Mini Mite 25-watt tube amplifiers using both KT77 and 6L6 output tubes. The speakers are a pair of Acarian System Alon 1. My records are regularly cleaned with a Nitty Gritty vacuum record-cleaning machine. The stylus is cleaned periodically using Last 4 stylus cleaner. I oil both the turntable bearings and the turntable motor with Singer sewing machine oil as part of my regular maintenance about once a year. The first thing I noticed about the new Ortofon was that this might be the lightest phono cartridge I have ever used. According to the manufacturer’s specifications, it weighed only 4.1 grams. I had to push the counterweight all the way forward to achieve a tracking force of 2 grams with the cartridge, and this was with my heaviest headshell. I had some other headshells and so I decided to use an Audio Technica one, supplementing it with a 2-gram weight to make it easier to get the sound I wanted. Using 2.4 grams seemed to get the sound just right and firm up the bass. I set the anti-skate to just below the tracking weight. The vertical tracking angle is difficult to adjust on the MMT tonearm because you have to reach two screws in a difficult-to-reach area, although the minimum position always seemed to work well with my setup with all of my cartridges. The MC1 Turbo has a fairly tall stylus so you may have to raise the rear of the tonearm accordingly to get the optimum vertical tracking angle. The compliance on this cartridge is fairly low so you would probably need at least a medium mass tonearm. This cartridge was compatible with my MMT medium mass tonearm. The output is a healthy 3.3 millivolts. Installation was not too difficult. The stylus protector was nicely designed and easy to use. 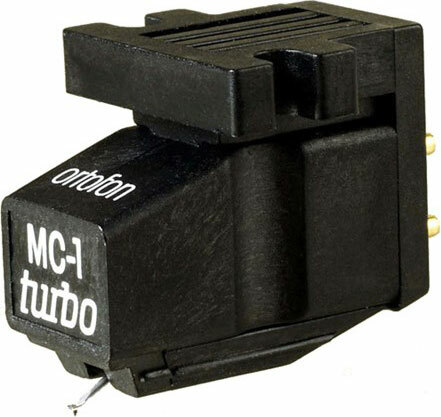 I liked the Ortofon MC1Turbo phono cartridge from the very first record I played. The bass was really deep. It was very quiet and surface noise was kept to a minimum, which is always mandatory for me. The treble was very sweet sounding and musical, the midrange was smooth and a little more forward than the Hana and the Grado. The balance through both channels was even. The Ortofon had the wonderful imaging and soundstage that connected me to the music. Tracking was outstanding with no inner groove distortion. The cartridge had no harshness and was very musical on a variety of records. There was a slight softening of the highs, which probably helped keep the record surface noise to a minimum. The Ortofon had a big sound, which seemed to sound closer to my moving magnet phono cartridges. This was probably because the 3.3-millivolt output was fairly high for a moving coil, even a high-output moving coil. This made the cartridge great if you play music with wide dynamics, such as orchestral music or big band jazz. This also made the cartridge suitable for rock, such as Steely Dan’s Aja, which I happen to be playing right now. Listening to Handel’s Water Music played by the Academy of Ancient Music had that nice midrange bloom that moving coils seem to exemplify. No matter what record I played, the Ortofon sounded natural and wonderful. I remember waking up early one Sunday morning and I could not wait to get out of bed and play records using this Ortofon. When comparing the Ortofon MC1 Turbo to other cartridges, the Ortofon had as much bass extension as the Grado Platinum and a little more bass than my Hana. Surface noise was kept to a minimum, similar to the Hana and the Grado Platinum. The Ortofon had no hum like the Grado and was extremely quiet. Yes, the $475 Hana exceeded the performance of the $240 Ortofon in just about every other category, as it should at twice the price. The biggest advantage my Hana would have over the Ortofon was that last bit of resolution that was only noticeable by a direct comparison. The Hana would completely disappear whereas I would notice the Ortofon. When compared to the new Sumiko Rainier ($150) and the Sumiko Black ($100), the Ortofon proved to be superior and well worth the difference in price. The Sumikos are still fine cartridges for the price and I am using them when I am in the mood for something different. I would be curious to see how the more expensive Sumiko Olympia ($199) would compare to the Ortofon because it is closer in price and would be a much fairer comparison. I may buy the Olympia stylus later and insert it into the Sumiko Ranier cartridge body. I also bought an Ortofon 2M Red at the same time I bought the Ortofon MC1 Turbo and the two cartridges could not be more different. While the Ortofon MC1 Turbo has a nice relaxed sound, the Ortofon 2M Red is very bright and forward with excessive noise. It could be a system mismatch. The Ortofon 2M Red with its 5.5 millivolts of output was probably too much for my NAD phono stage, although the Grado Platinum with 5.0 millivolts of output had no problems. Currently, the Ortofon 2M Red isn’t in my cartridge rotation at all. The Ortofon MC1 Turbo is such a wonderful phono cartridge that when it is time to replace or retip my Hana, I can take my time knowing that I have the Ortofon available. If you cannot afford either the Hana EH or the latest Grado Platinum, the Ortofon MC1 Turbo at $240 would be a very nice, affordable alternative. We here at Ortofon would like to thank Byron Baba for his review of our MC1 Turbo model, which has been in our lineup for over 20 years now. Despite our agreement with the author’s assessment on the MC1, we wanted to note that perhaps his listen of the 2M Red could have done with a bit of additional break-in time. Since the 2M Red is a high-compliance cartridge, versus the MC1 being a low-compliance, so much more of its sound is dictated by proper compliance of the suspension. 2Ms (and all of our MMs) really need about 30-50 hours to open up and become dramatically less strident.